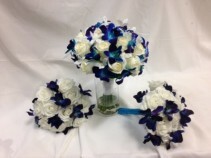 Deposit for wedding flowers will be applied to your order. You may also call Detroit Lakes Floral directly to pay your deposit. Deposit is non refundable. This lovely white and ivory cascading bouquet is created with mini calla lilies, open white roses, and astilbe. The handle is wrapped in lovely diamond white satin ribbon. 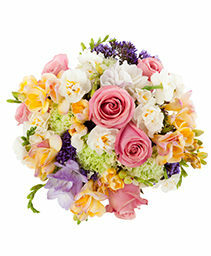 This bouquet is available in fresh flowers (featured pricing) and artificial flowers (125.00). 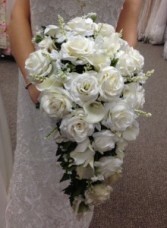 Walk down the aisle with this stunning bridal bouquet. 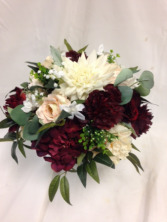 Contains these elegant flowers: large football mums, Juliet garden roses, Amsterdam roses, dark plum dahlias, deep plum cushion mums, ivory cushion mums, ivory stock, dusty miller, seeded eucalyptus, caspia and white wax flower. The stems are wrapped in soft ivory satin. Make DETROIT LAKES FLORAL your first choice for premium fresh flowers and upscale design artistry for your dream wedding and all your special occasions! 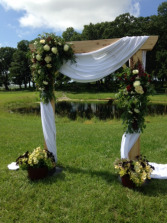 At DETROIT LAKES FLORAL, we go the extra mile to ensure your flowers are more than a memory. Our wedding consultants can offer lots of beautiful style suggestions in an effort to create the overall look you hope to achieve. Wedding flowers are something you will remember for a lifetime. These are the flowers that will always trigger special memories of the day you shared, so it's important to pick something perfectly you. 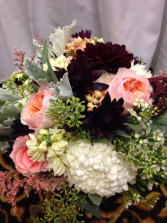 Just as important is choosing the right florist and DETROIT LAKES FLORAL is ready to help you! Call us in advance at (877) 838-3842 to schedule a consultation. We'd love to help you start planning your dream wedding or your next successful event. We want to provide you with flowers that are as beautifully unforgettable as your wedding day memories will be. 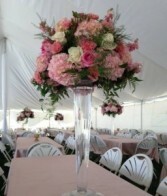 Call DETROIT LAKES FLORAL today! Due to weather conditions deliveries may be suspended until conditions allow. Orders placed after 12 noon cannot guarantee same day delivery. We are sorry for any inconvenience. Deliveries will be available for the following week day.